TRUMPower has added the new 25-36W TDM36 series of low cost medical grade AC/DC desktop power adapters to its product line-up. Using the power supply ensures compliance to the latest IEC/EN 60601-1-2 4th edition EMC standards. The TDM36 Class I units come with an IEC 320/C6 or ITE 320/C14 AC inlet and class II units are furnished with an IEC 320/C8 or IEC 320/C18 AC inlet. The series offers standard single output voltages of 5V, 7.5V, 9V, 12V, 15V, 18V or 24V with continuous output power of up to 36 watts; other output voltages are available upon request. Both Class I and Class II units come with a standard 2.5 x 5.5 x 9.5 mm barrel output connector. TRUMPower offers additional connector and cable options and can accommodate special requirements. The TDM36 series is approved by UL/cUL and TUV to the latest medical standards, including IEC/EN/UL 60601-1 Edition 3.1, ANSI/AAMI ES 60601-1: 2012, CSA-C22.2 No. 60601-1: 2014. The power adapter complies with IEC/EN 60601-1-2 4th edition medical EMC and immunity standards including EN 55011 & 55022/FCC/VCCI class B (conducted and radiated emissions), EN 61000-3-2, EN 61000-3-3, EN 61000-4-2 (ESD at 15kV air and 8kV contact), EN 61000-4-3, EN 61000-4-4, EN 61000-4-5, EN 61000-4-8, EN 61000-4-11. With efficiency of 84% minimum @ full load, the TDM36 series is in compliance with CEC & Energy Star level VI and ErP stage II requirements. It carries CE marking, is RoHS compliant and has PSE approval as well. Packaged in a low profile black-colored plastic enclosure with LED power indicator, the unit has a compact size of 3.94 x 1.97 x 1.3 inches. 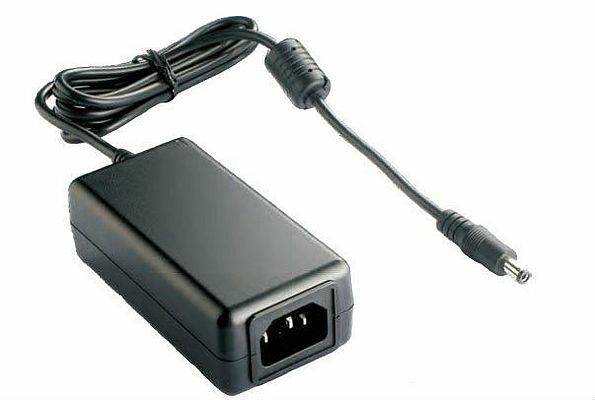 The BF rated power adapter has a 90 to 264 VAC continuous input range and 0.9 power factor. Withstand voltage is specified at 4,000 VAC from input to output (2 x MOPP) and 1,500 VAC from input to ground (1 x MOPP). With touch current being lower than 100µA, the TDM36 power adapter can operate at an ambient temperature range of 0°C to +40°C. Its MTBF is higher than 300,000 hours at full load and 25°C ambient, calculated per Telecordia SR-332. With no load power consumption <0.1W, the power supply is fully protected against overvoltage, over-current, and short circuit conditions.